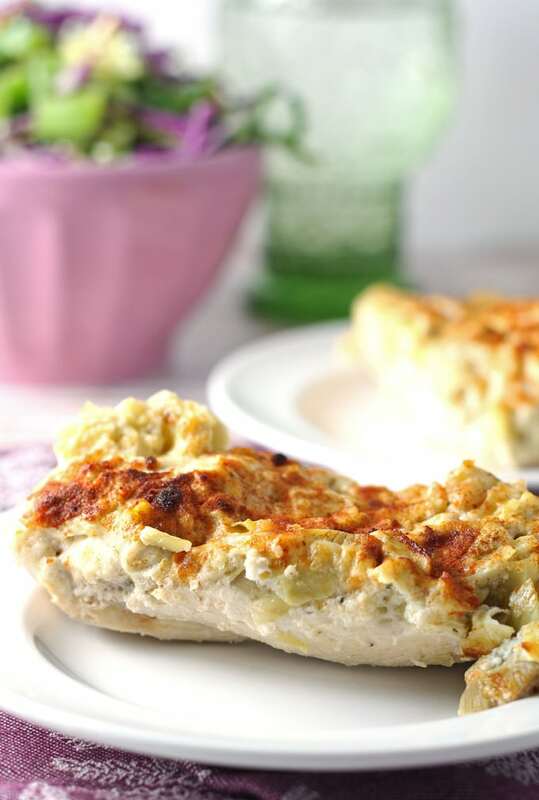 When chicken for dinner gets boring, make this Parmesan Artichoke Chicken dish! It’s easy, hearty and pairs perfectly with a side salad. Updated Recipe from the archives: First posted in February 2013. Many of you were probably not even aware that at one point this site went by another name… so much has changed in the past 2 years. I decided to make this again and rephotograph it for the third time, in addition to rewriting the post a little bit. While the photographs and the text may be different. the recipe hasn’t changed at all. It is still Mr. B’s favorite thing that I make, ever. 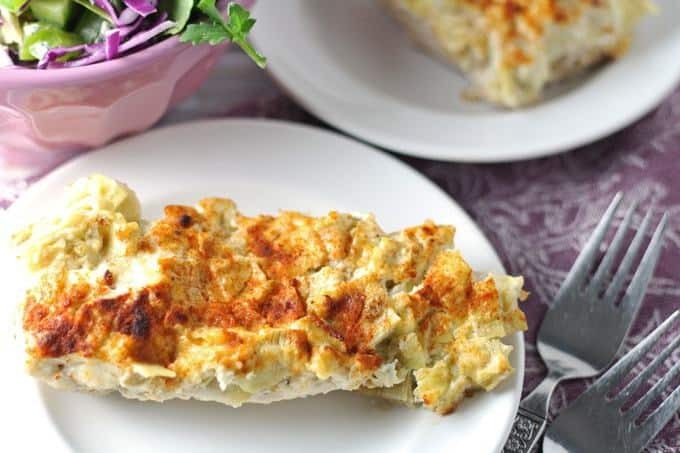 I expected that to change with all of the recipes I have come up with since this blog started but he has stayed true to his love of my parmesan artichoke chicken recipe. We used to do a lot of cooking together, back in the day, and it was our favorite activity together. When we were dating, we would take over the kitchen, chef and sous chef, and create delicious dishes several times a month. 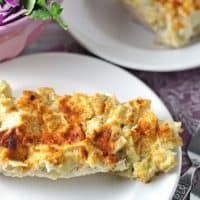 One of our old recipe finds was a recipe for Artichoke Chicken from allrecipes.com. Its super easy to make. Unfortunately, its not all that healthy so over the years we’ve done a few things to change it up. If you are going to make this for a crowd, you can combine the artichoke mixture ahead of time and store it in the refrigerator for several hours. Turn on the oven to preheat it and take the artichoke mixture out of the oven to get the chill out of it. Don’t pack the chicken too tightly into your baking dish – as the chicken cooks, its juices will fill up the pan. If you have too much chicken in the dish, it will produce a lot of juice. Also, the paprika is there for color and not taste. I like to give a good sprinkling to the top of the artichoke mixture so that it doesn’t look like a dish of brown food. 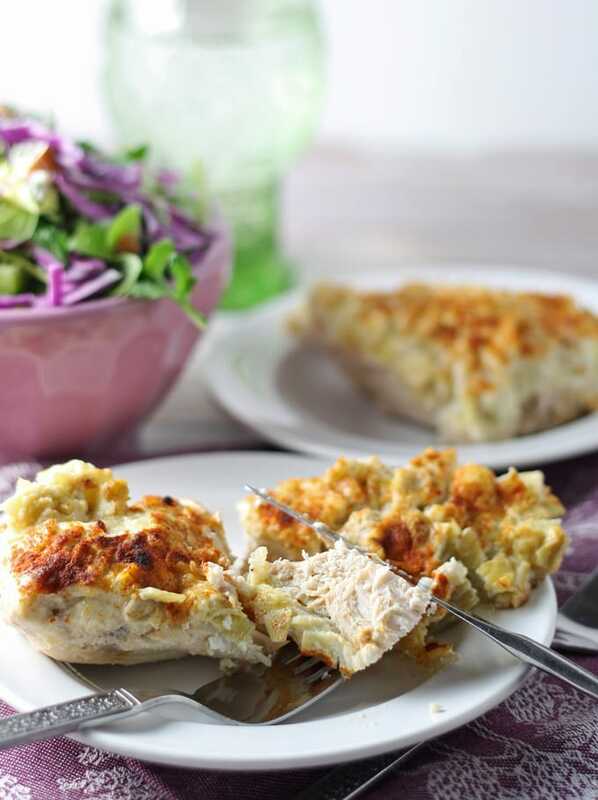 When chicken for dinner gets boring, make this Parmesan Artichoke Chicken dish! It's easy, hearty and pairs perfectly with a side salad. Preheat oven to 375 degrees. Grease a baking dish (I used a 9x13 casserole dish.) Clean chicken breasts and and cut away all excess fat. Finely chop artichoke hearts. Combine artichoke hearts, parmesan, mayo, sour cream, pepper and garlic powder in a medium bowl. Layout the chicken breasts evenly in your prepared baking dish. Spread the artichoke mixture evenly over the chicken. Sprinkle paprika over the artichoke mixture. Put the chicken, uncovered, in the oven. Let it cook for 30 minutes, or until the juices run clear. You can also use a meat thermometer but be careful when inserting and removing it so that the artichoke mixture doesn’t fall off. Serve hot. Looking for more chicken dinner recipes? Try this recipe for slow cooker fiesta chicken or chicken fajitas! Oh wow, this looks awesome! Can’t wait to try it! I just found your site but there’s no email address subscribe button. So please sign me up for the newsletter! Thank you. Thank you for letting me know Jan – there was a subscribe section that somehow disappeared but is fixed now. I have added you to the list, so watch your email to confirm the subscription. Love this Parm and artichoke combination – a perfect weeknight meal! Artichokes are such a great addition to this dish. Looks delicious! Holy cow this looks amazing! YUMMMMY! This was delicious! Thanks for the recipe! Thanks Liz! Glad you liked it! This recipe looks amazing! It is also gluten-free…thank you! I love anything with artichokes! Can’t wait to try this recipe. Pinned for later. This looks like such a good recipe. I will have to add it to my list of ones we want to try. I LOVE artichoke. 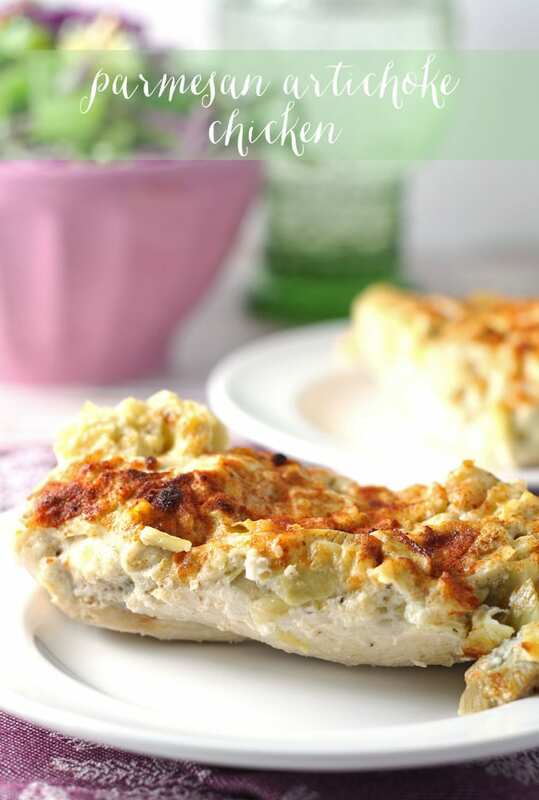 I love the combination of artichokes and parmesan cheese with chicken, I can see why this recipe is a favorite! Thanks for sharing at What’d You Do This Weekend? I hope you will join us again this Monday! Good morning. Just wanted to pop in and let you know we chose this fabulous looking Artichoke Chicken as one of our personal favorites at last week’s Weekend Potluck. I absolutely love this flavor combination. Your photos are gorgeous.Thanks so much for linking up and have a wonderful weekend! Thank you soooo much Kim!! Feel like a cooking star when you whip up this deliciously simple Italian chicken piccata with artichokes and a savory lemon sauce using only one pan! Oh man! This looks SO DARN GOOD! I love artichokes, and this looks like my new favorite meal! This looks fabulous, can’t wait to try it. Found you on Think Tank Thursday. 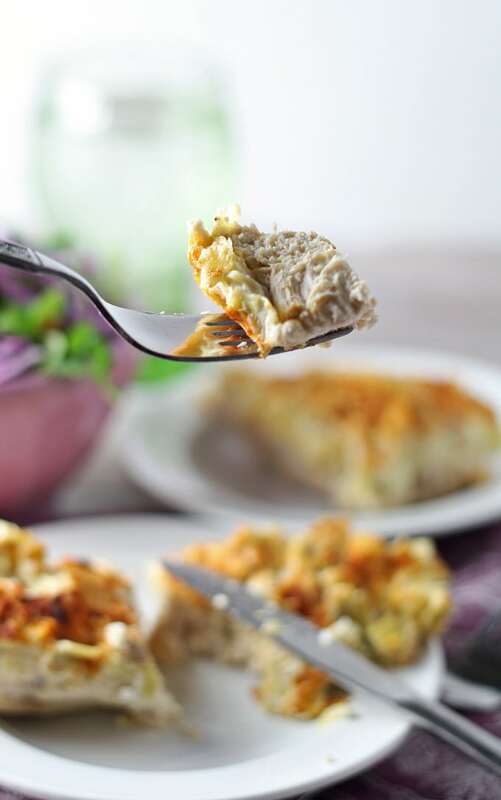 Looks delicious – love that crust on the chicken! I make something like this, but your photos are gorgeous! Really looks scrumptious! That’s a great tip about leaving a bit of room in the pan! Thanks for sharing this with us on Throwback Thursday last week!